Landscaping involves a lot of activity such as architecture, landscape lighting, planting, sprinkler systems, lawn treatments and the list goes on and on. This may be overwhelming to wrap your head around if you’re planning to do the landscape by yourself. The wisest option would be to get in touch with professionals for a quality job that will leave you in awe of your front or back yard. 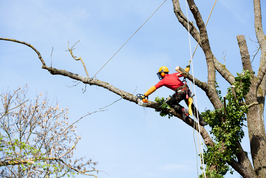 At Tree Services Annapolis, our Annapolis landscapers have got you covered. It is important for homeowners to at least have an idea as to what they hope to achieve with the extra outdoor space in their homes. Plenty of design ideas can be found on the internet and even in our surroundings. We provide Annapolis landscaping designs as well to give the homeowners a choice and professional advice for the landscape designs. As people's taste and preferences vary, the needs may range from soft scape (plants), while others may prefer hard scape (patios) or even a combination of both. Some people may want to lean towards environmental friendly landscapes that save on water and give a natural habitat look. Others may opt for a more modern or tropical look. Structures such as outdoor kitchen or bar, swimming pools, ponds, fire pits or even ball courts are other alternatives to choose from. Whatever the design you prefer, make sure to communicate with our professional Annapolis landscapers to ensure that we work together to get you your end desired look. Horticultural knowledge is required for landscaping. That is why it is a task that requires both art and science to turn your ideas into something visual. The first step towards the landscaping process is to work out a plan in conjunction with our Annapolis landscapers to ensure it suits your needs. The plan should include solutions to likely problems that affect Annapolis landscaping such as the sun, wind, slope and limited space. The second step is the construction phase. This will generally involve plants, terrain, and structures depending on the design that you choose. Plants may be native, edible, ornamental or other different types of plants used in landscaping. Installation of irrigation systems may follow to ensure the plants are well maintained. The land’s shape may be changed as well, what is referred to as terrain, through grading, backfilling, mounding and terracing. There may also involve the construction of structures such as fences, covers, walls, patio, raised planters or several other built features. Demolition of unwanted materials to give way for construction is sometimes inevitable. To conclude, recent years have seen homeowners take a great interest in their outdoor spaces. What was once a park or public space affair has now extended to residences. Not enough can be said regarding the appeal brought about by landscape designs to your home and the value it adds, hence the growing need for the service. Tree Services Annapolis would like to be your Annapolis landscapers. We can bring you a myriad of customized designs for your landscaping at an affordable budget that will transform your home exterior. This will enable you to dine, relax, entertain and bond with family and friends in your serene outdoor space.